In just two short years, Hotel Indigo has taken local hospitality to new heights…quite literally. Its signature rooftop bar has been drawing hotel guests and locals alike wanting a bird’s eye view of West Grand Traverse Bay. Named H&L Social (after local lumber barons, Perry Hannah and A. Tracy Lay), the bar may well be the “icing on the cake” of a property that, though a national brand, celebrates the unique origins of Traverse City. “We’re all about local,” explains General Manager, Bridget Hawks. 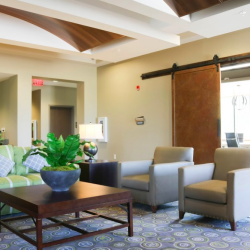 “We’ve purposely integrated elements of the lumber industry—a rich part of the city’s past—into the design of the hotel.” This is evident the minute you walk through the door. Stamps from the different lumber mills are used as a design motif in the living room area and fitness center. The boardroom table is impeccably handcrafted with maple. 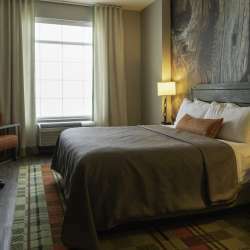 Perhaps most notably, the guest rooms have beautiful wood accents that would make any 19th century lumber baron proud. Speaking of guest rooms, all are tastefully decorated with landscape and nature images captured by local photographers. The walls are done in soothing earth tones, reflective of the area’s natural beauty. Each bathroom features a sturdy barn door, handcrafted by a local artisan. While the hotel has certainly captured the natural feel of the area, the amenities definitely have an upscale, urban edge. The ground-level restaurant, Warehouse KiTChen + Cork, offers fresh, locally inspired fare for breakfast, lunch, and dinner (ask about the s’mores cake for dessert…with homemade marshmallows. Yum!). H&L Social is a great evening option for live entertainment, amazing craft cocktails, and breathtaking bay views. 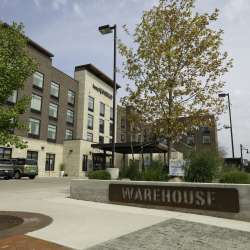 Of course, being located in the popular Warehouse District, Hotel Indigo is walking to distance to all the shopping, dining, and entertainment options that downtown Traverse City has to offer. At the end of it all, for those wanting an extra measure of R&R, the hotel has a full-time (yes, full time!) chiropractor and massage therapists on hand. “We wanted to blend Traverse City’s storied past with its bright present and future into one exceptional guest experience,” says Hawk. Hotel Indigo certainly seems to have achieved that.